Knowing the process is one of the most important habit for highly skilled instrument engineers and technicians. To be effective in your job, you must have a thorough understanding of the process and how the various instruments in the plant/process interact to produce the desired outcome. One starting point in knowing your plant is learning how to read P&IDs and Process Flow Diagrams (PFDs). Every instrument engineer and technician is required to be able to use available engineering tools to interrogate the process to get all kinds of results to diagnose problems with the instrumentation installation. Tools like meters, calibrators and other necessary troubleshooting instruments should be leveraged upon by a good instrument engineer and technician to solve problems that occur in instrumentation installations. Nobody will likely succeed in any endeavour without a mentor. Mentors are key building blocks in acquiring necessary engineering skills in the field of instrumentation. Mentorship will help to sharpen the skills of engineers and technicians and possibly shape their careers. 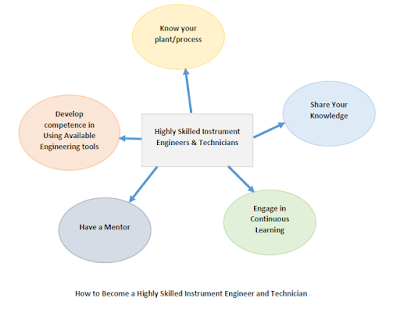 Every instrument engineer and technician aspiring to become highly skilled and successful needs a mentor. 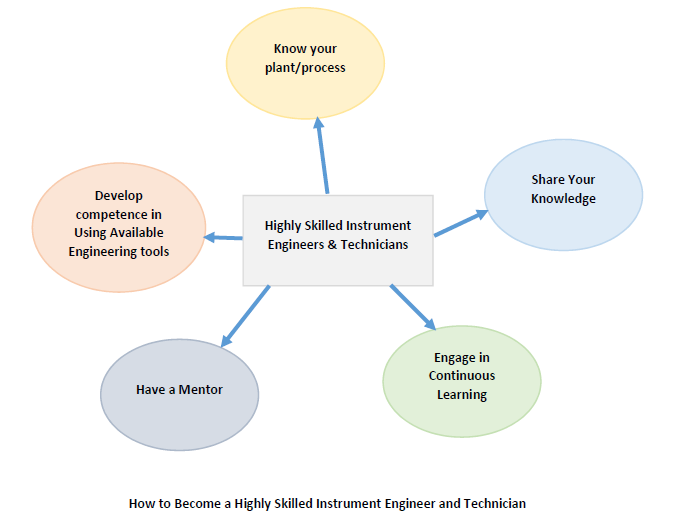 Many companies run different kinds of mentorship programme to help to instil the necessary skills in their instrument engineers and technicians. Learning in engineering is a continuous process. Continuous learning and training will help to horn your skills as an instrument engineer and technician. In a world that has been redefined by the advent of the internet, training in anything has been made easy because of the multiplicity of materials everywhere. In fact today, you have a huge number of training resources available. You can take training courses in your plant, at a training center, or over the web. You can quickly find instrumentation books and articles on the web just be doing a google search! One other quick way to learning is curiosity. You must have a natural curiosity to be able to learn new things and ask questions especially when you don’t know. There will always be someone, somewhere in your plant or company ready to share knowledge. In the field of instrumentation and control, knowledge is king. A thorough knowledge of your process/plant will make you solve many problems in instrumentation and control. However, sharing your knowledge with others can help to make you and them more effective in your given tasks. It is therefore imperative that you strive to share whatever knowledge you have gained with colleagues and co-workers.